It was the first day of school, and B approached the campus carefully, not knowing what to expect. B grew up around a standard set of icons, and in order to fit in, he decided to be standard as well. He maintained a thick vertical stroke, complemented by two horizontal arches. On a normal day, these arches were symmetrical. If B was feeling expressive, he would make the top one smaller. If he was feeling really rebellious, he would make the bottom one smaller, but he never really liked that look, it made him feel upside down. B saw this new school as an opportunity to re-discover himself. He wanted to find out where he belonged, but such a thing is difficult to find quickly, so B decided to keep to himself for most of the year. One day, however, he saw something that stopped him in his tracks. Her name was Q. She wasn’t like the other glyphs he had hung around with before. She wasn’t afraid to embrace angularity. She wasn’t afraid to challenge expectations. She was made of bold, powerful bars that seemed to dance even when she was standing still. Her points never quite aligned, but that’s what made her unique. That’s what made her stick, and B cherished her for it. 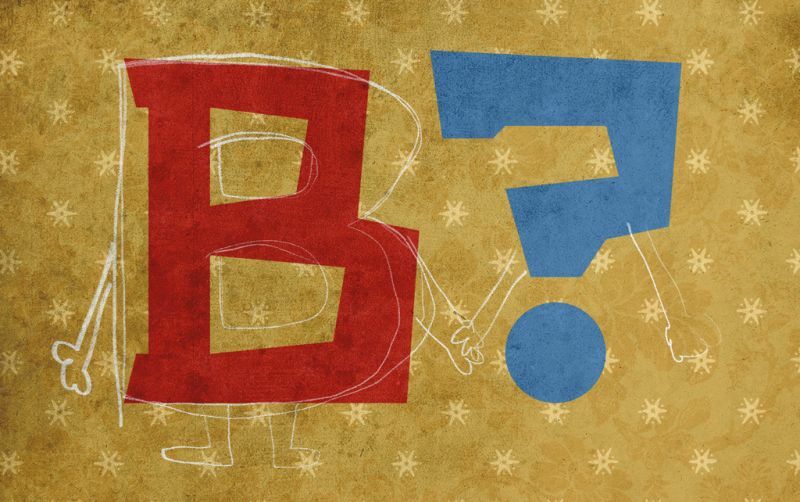 B was in love, but his love was not without its trials. Q ran with a very different crowd than he was used to. They threw tradition out the window. They were all angles and diagonals, and B felt like an outsider whenever he was around them. As his feelings for Q grew, he experimented with different ways to fit in. He added serifs to his stem, but they looked silly compared to his large sloping bowls. He tried varying his widths, raising and lowering his cross bar, but nothing ever looked quite right. He never felt like he quite belonged. Q tried to comfort him as best she could. She told him it was okay to be traditional, and that the most important thing was that he was functional. That word, “functional,” made B cringe every time. B wanted to be more than functional. Function meant tradition, tradition meant repetition, and repetition was boring. As the first year of school came to a close, while B was outwardly happy, inwardly, he was desperate for a change. Every day over the break, B worked on a new look. He wanted points. He wanted movement. He wanted to be special. There was a gasp on the campus when B walked out that first day. He paused, unsure of his decision, but then he saw Q again, and all of his fear went away. She smiled. As Q’s friends gathered around them, B felt that he finally belonged, and that now, these were his friends too.